Very disappointed to miss Taran Matharu's launch last night (especially since there were crochet dragons!!) but thrilled to host a guest post from him today! I spent most of my launch party full of a strange combination of nerves and excitement. It felt rather like having an important exam on the same day as my birthday party. I was so giddy I got on the wrong train twice on my way there! When I did arrive, it was amazing to see my book on the shelves. It was the first time I had seen it on a store shelf in person and I felt a real sense of achievement when I saw it there. Then, the wonderful team at Hachette arrived and we began to set up, laying the books out on the tables and organising some of the seating. My brother was rather late arriving with the food and wine, so I spent quite a while walking around in a bit of a panic. Thankfully, he did eventually get there and we managed to bring it all in and get the party started just in time! It was amazing to have such a fantastic turn out. There were so many familiar faces, both old and new, including my team at Hachette, my friends from school and university, old colleagues, fellow writers and of course my extended family. I felt so grateful that they had come to celebrate with me and I somehow managed to speak to everyone before it was time for the speeches. Oh boy, the speech. Naomi – my editor – gave me a fabulous introduction that genuinely had me blushing. It was warm and heartfelt and I appreciated every word of it. Then it was my turn. It came as a complete surprise to me when my voice started wavering and I felt myself begin to tear up a little at the start. It really was such an important moment for me and I ended up a bit emotional, especially when thanking all the people that had helped me get there. Luckily, I managed to force it down and finish the speech without anybody noticing. I then did a quick reading. Despite having done three much longer readings to groups of sixty children, it was probably the most nerve-wracking of them all. I relaxed after that and did a whole bunch of signings, giving me a chance to catch up with everyone I had missed. We sold out of books very quickly, but somehow ended up having the exact number of copies that were wanted. Perfect! 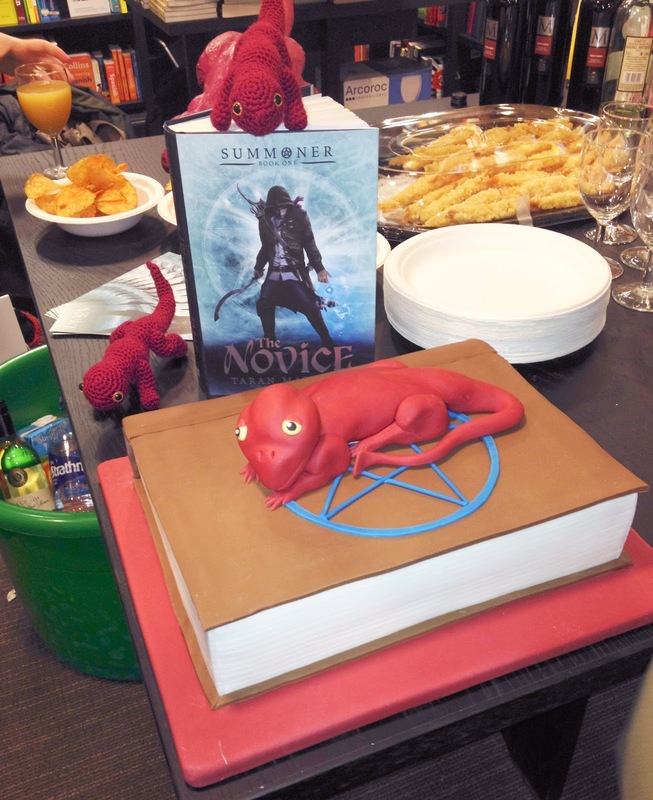 After that, I cut my amazing cake, which had been designed with a gorgeous salamander demon on the top! I loved it and it tasted amazing too. It was a wonderful surprise that the team at Hachette had brought for me. Finally, it was time to just have fun and socialise, before heading to the bar to round off an amazing night. I can honestly say it was one of the best nights of my life and I will remember it fondly for years to come. I went home with a grin on my face and a full heart after what can only be described as the perfect evening. First off, I want to say a huge thank you to everyone who has come to celebrate with me tonight. It’s great to see so many friendly faces together, both old and new. I also want to especially thank Rob, who has made the supreme effort to attend. Thank you Rob, it means a lot to me. Today is the culmination of a lifelong dream of mine, one that began when I was nine years old. I remember attempting my first novel then, a story about a wizard warrior family who battled with an evil witch. I know my mum still thinks it’s publishable. For me, writing was just that, a dream. For a long time I imagined authors as these literary geniuses, mythical creatures that you never get to see. 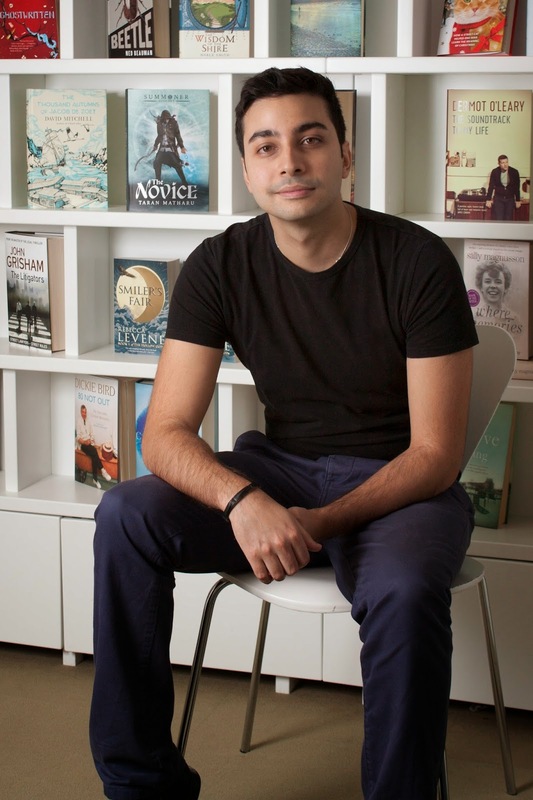 It was only after I interned at a publisher and got to meet a few of them that I realised that they were just like me – people with a passion for reading and writing . So, I started writing my dream book, the kind of book that combined everything I loved about fantasy into one novel. I attempted the National Novel Writing Month challenge, to write 50,000 words in one month. I shared it online each day to and to my surprise the book started to go viral. After that it all went a bit crazy, but its safe to say that I have been on a high ever since. There several people that I owe a debt of gratitude to and I want to thank them tonight. First, my mother. You were always the one pushing me to write, encouraging me and sharing it with friends and family, even saving it from old computers to make sure it wasn’t lost. It was you who gave me the self-confidence I needed to put my work out there. I would not be standing here today without you. I would also like to thank Alice, my girlfriend. I am a bit of a night-owl and I would often keep her up late, tapping away on my keyboard until three in the morning when the mood took me. Even then, she would read everything I wrote and edit it there and then, so that I could provide a better experience to my readers around the world. She had been a rock throughout all of this, helping me in my decisions and being my sounding board whenever I need it. Thank you, Alice. It’s no wonder that this book is dedicated to both Alice and my mother. I want to thank Katie and Riot Communications for their incredible work on The Novice’s publicity. She has done such an amazing job and I feel lucky to have had her on team summoner. Thank you so much Katie. I want to thank Hodder Childrens, with Laure, Jen, Victoria, Jason and Paul just a few of the many people who have helped me get to this point. You have all done a stellar job and I really appreciate it, so thank you. I am also immensely grateful to my agent, Juliet, as well as her assistant, Sarah. She has been my guiding light, helping me navigate the world of publishing and being massive advocate for me and my writing. Juliet has found a home for Summoner all over the world, and I am truly grateful for that. Thank you so much Juliet, you are incredible. I also want to thank Naomi Greenwood, my editor. Having a good editor who gets you and your story is so important and boy did I luck out. Together we have polished The Novice into something I know we can truly be proud of. Naomi has gone above and beyond the call of duty, assuaging my fears and doubts as well as supporting me in everything from Marketing to PR. I also need to thank Naomi for believing in me and my work. It’s easy to forget what a huge leap of faith it is to take on an author you know so little about, especially when they are a debut. I am so grateful for the opportunity and I hope I have done you proud. Thank you Naomi. And that’s the end of my speech. Now I will do a short reading for you all from the book. Thanks for listening. For various reasons I generally keep the personal posts to a minimum here, but just wanted to talk about what blogging's done for me for a bit. I was incredibly lucky a couple of weeks ago to have a fantastic opportunity - Hannah Love from Faber & Faber e-mailed me to ask me if I'd be interested in doing an interview with Siobhan Curham, author of True Face, for the Down The Rabbit Hole radio show. I read the e-mail, was immensely flattered (I think True Face is a brilliant book which is one I'd highly recommend all teens to read, and Siobhan is a fantastic author), and immediately typed my response. "Thanks Hannah, so lovely to be asked - really flattered! Going to pass though as radio really isn't my kind of thing, but thanks again for asking." So what changed my mind, and stopped me sending that e-mail? In addition, on the day of the interview, when I was seriously nervous and trying to work out whether to cancel it or not (I PROBABLY wouldn't have done that to you, Hannah, honestly!) I had fantastic support via DM from Charlie, who gave me great advice, Stacey, Debbie, Mel, Abi and Louie, all of whom were really thrilled for me. A huge thanks to all of them - and, of course, to Hannah and Siobhan for giving me the opportunity! Having so many supportive friends is something I'm still getting used to, and I am massively grateful to all of them. 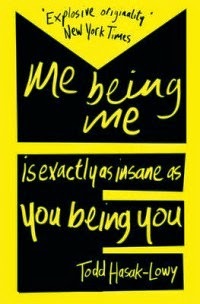 I'm currently reading, and enjoying, Todd Hasak-Lowy's Me Being Me Is Exactly As Insane As You Being You, which is a novel told in lists. I'm intrigued by the format, so when I got the chance to host a guest post from Todd, also in the form of a list, I jumped at it! After writing out a dozen or so lists on a whim, you ask yourself: Huh, can a whole novel be written in lists? Well—you tell your giddy self—there’s only one way to find out. So you give it a try. You don’t worry about how good this novel in lists is or, more to the point, if a novel in lists is a good idea in general. Welcome to the fun stage, the innocent stage, the manic stage, the stage free of doubt and self-loathing. Once you’re done with that full first draft (and, hey, congrats on that, very impressive, you wrote an entire novel in lists) you must figure out what to do with the thing. But how can you tell if your novel in lists is any good? Sure, to some extent you can answer this question the way you would with the first draft of any novel. Are the characters interesting, is the story compelling, does the ending satisfy? But then that whole list format, how do you know if that’s any good? What are you suppose to measure it against? How would you know if the whole gambit was in fact just a stupid idea? You freak out. Just a little, but you’re definitely freaking out. Because what is everyone going to think? Are they going to be willing to play along? Will they accuse this novel of shameless gimmickry? Okay, chill out. There, that’s better. But now you’re a little sad. Actually, more than a little. Because you feel yourself nearly ready to be convinced by others that the whole conceit might not work in the end. But then, hooray, you decide you’re going to see this through. Call it a hunch. Or maybe just a wish. Or maybe your editor talked you down. Regardless, you’re going ahead with it, determined to make this thing the very best version of its strange self. Which is hard enough when revising a regular novel. But this is no regular novel. So now, lucky you (lucky determined, stubborn, pig-headed, supported-by-a-wonderful-editor you), you get to do stuff like the following: spend a week trying to figure out how to make the elusive attraction between the two main characters a little more palpable, a bit more concrete, just a tad less mysterious. You pace your back and forth in your little office. You take long walks. You lay awake at night. Finally, while out with your loyal dog, it strikes you. Hooray! At which point you realize: awesome, now I need to decide how to narrate that in list form. Repeat this process about ninety-four times. You had a working title, right from the beginning. But it’s pretty lame. So you think, no biggie, I’ll figure out another title, after all every single one of the many lists in this book has its own title. I’ve got a lot of practice coming up with titles. You write up a few for the whole book. They stink. You write up more than a few more. You keep a separate file filled with such titles. Every couple days you send some to your editor and/or agent and/or wife, and every couple days they say, separately or together, nope. Then, who knows why exactly, your agent gives the manuscript to two interns, interns you’ve never even met. He tells them, read this and pull out interesting phrases. A week later, there’s a title. You thank them over email. You can feel that the novel is getting better, in terms of all that crucial regular novel stuff. But there’s some lingering reservations among agent and editor that this not-so-little book of yours is still going to scare off a lot of readers. After cursing and dismissing such readers in strikingly immature fashion, you finally get over yourself and submit to the wisdom of your professional advisors. You think and you think. You tinker and tinker. You walk the dog. You write an entire draft that is 15% non-list, only to realize that this is all but admitting that the format is a pain in the behind. Somehow, eventually,you come up with this solution: the narrative will oscillate with some regularity between very short lists and longer lists that read more or less (I’d say less, but whatever) like regular prose. Magically this seems to work. Holy crap, you’re done. Finally, there you are with the actual book, the physical book, the one with the cover and everything. The one with your name on it. Wow. You try to appreciate this, without worrying about how many people will read it or what they’ll think when they do or how you’ll explain this complicated book in two sentences to people generous enough to give you two sentences worth of their attention. Then you catch yourself and wonder: Why is it so hard just to be happy about it? But then, weirdest thing, for a second or two, maybe even ten, you really are happy. Or at least satisfied. Yes, you’re definitely satisfied. Really and truly you are. You actually did it. Good job, you tell yourself. Then you look up, already distracted by this newer manuscript you’ve been wrestling with. It’s a disaster, albeit a genuinely promising disaster. Okay, enough of the self-congratulation, time to get back to work. I read All Fall Down on NetGalley, and was sent a copy of Spotlight on Sunny by Catnip, in both cases for consideration for a recommendation. Thanks to the publishers! Keris Stainton's Spotlight on Sunny is the second in her Reel Friends series, following on from last year's Starring Kitty, a favourite of mine. The first book was a sweet, tender romance about Kitty, who was in love with another girl, trying to navigate a relationship without at first feeling quite confident enough to come out to her friends. This sequel follows the same group of friends - Kitty, Sunny and Hannah - but shifts to Sunny's point of view, and moves the action to London, where the trio take part in a film-making course. Sunny is happy to be in London but has to keep a big secret from her friends, as well as doing the course and making a new friend in the lovely Will. This is similar to Kitty in many ways - it's a really sweet, charming read. I particularly like the dynamic between the central trio, who are extremely close friends despite having very different values - Sunny is a Muslim and has massively different ideas about boys to Hannah, for example, but both characters' views are expressed well and non-judgmentally, and they respect each other despite their differences. I also thought Sunny's relationship with her parents was very well-portrayed. There's a wonderfully diverse cast, with wheelchair user Will being great to read about - charismatic and funny - and even someone who originally seems to be a slightly stereotypical bad girl shines towards the end as we see more of her character revealed. I also really loved the way Keris Stainton captured the thrill of exploring London when you're unfamiliar with it, the setting is brought to life brilliantly! 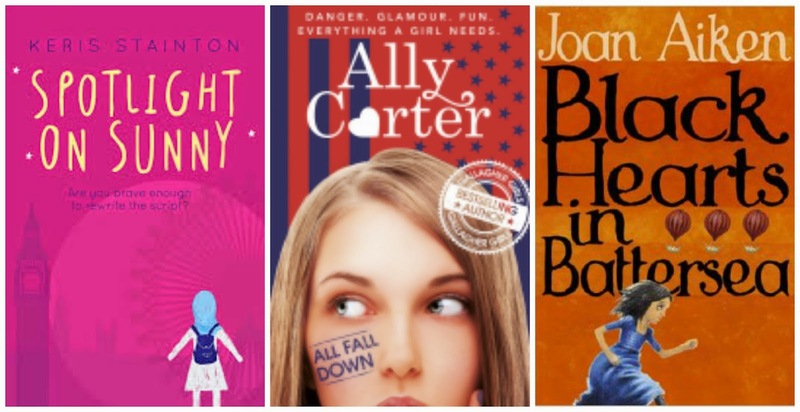 Ally Carter's All Fall Down, first in her new Embassy Row series, sounded like an intriguing read - I like what I've read of Heist Society and am a huge fan of her Gallagher Girls books. This new series, set in the fictional country of Adria, follows Grace, the granddaughter of the American ambassador to the country, as she moves in with him. Three years ago, she saw her mother murdered by a mysterious scarred man - but no-one believes this, claiming the death was an accident in a house fire. After seeing the scarred man again, she's determined to investigate, with the help of her friends. In a lot of ways this is very good - Ally Carter always writes excellent action scenes, her character development is superb, and while I correctly predicted part of the central storyline, there's a stunning ending which took me by surprise. My only issues with it are that it takes a long time to get going - the pacing seems off, particularly early on - and the cliffhanger ending combines with this to make it feel more like a very strong set-up than a hugely satisfying read in its own right. That said, I'm now really looking forward to the next book. Chalk this one up as a good read that could become a great series, I'd say. I re-read Black Hearts in Battersea recently, after author Julia Lee named Dido Twite as her favourite MG heroine in a Top Ten Tuesdaypost on MG Strikes Back - I'd been seriously considering her, but she was edged out by Stephanie Burgis's Kat Stephenson for me. Actually, the two characters are similar in many ways. They're both incredibly bold and brave, fiercely loyal to those they love, and willing to do anything to help them. While Kat has the advantage of a supportive family, Dido has a much worse-off start in life, the younger child in a family of Hanoverian plotters determined to overthrow the King. She'd go on to be the main character in this long series, but in her introduction here the street urchin has a supporting role to heroes Simon and Sophie - although she steals the scene every time she appears, with her fantastic language and the way she stands up for her friends even though she knows it will get her into trouble with her parents. Simon, an orphan coming to London to look for his friend Doctor Field, and Sophie, his friend from the orphanage who's now a maid to the Duchess of Battersea, are a fantastic pair of heroes, while the Duke and Duchess of Battersea are adorable characters. As for the villains - wow! I generally prefer more subtle characterisation, but Aiken is one of the writers talented enough to just make her evil characters completely and utterly repelling, and absolutely captivating because of this - you'll spend the entire book desperate to see them get their comeuppance. As well as the great characters, it's an incredibly fast-paced read with lots of brilliant twists and turns. I've never actually finished the series somehow - very strange considering how much I loved the first five or six books, and how many times I've reread this one - but am aiming to do so this year, and will try and review as I go! Denton Little's Deathdate looks fantastic and I'm really looking forward to reading it, so I'm thrilled to have author Lance Rubin today, talking about his favourite funny first-person narrators! 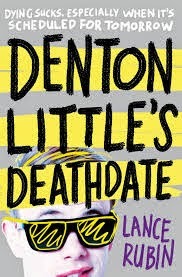 At first, my YA novel Denton Little’s Deathdate was written in the third-person. It didn’t feel quite right, though, so I quickly made the switch to the first-person and never looked back. I’ve always loved a first-person narrator. It makes me feel like I’m hanging out with my most uninhibited friend. And if this friend is funny, I’m even more likely to keep reading. Here, in no particular order, are my ten favorite funny first-person narrators. There are many other great ones I don’t have room for, and undoubtedly many more that I have yet to read, but this is a good place to start. Christopher John Francis Boone, the 15-year-old autistic narrator of this book, lets the reader know right up top: “This will not be a funny book.” And yet, as Christopher tries to solve the mystery of his neighbor’s murdered dog, he’s often quite funny, his literal thought patterns hitting upon hilarious truths about the world. As readers, we’re never laughing at Christopher, though; Haddon helps us fully inhabit Christopher’s mind and come to understand the unique and inadvertently amusing way it operates. With his dad in jail and his family in a homeless shelter, Tyrell’s had no choice but to develop a thick skin. As the reader, though, we know he’s way more vulnerable and big-hearted than he might let on, and his candid and astute observations about life made me laugh so much. His feelings about Novisha, his girlfriend, and Jasmine, a girl he meets at the homeless shelter, crackle with humor because they feel so embarrassingly true to how a teenage boy actually thinks. It’s easily one of the most authentic teen love triangles I’ve ever read. I finally read this last year, and I’m sorry I waited so long. Margaret Simon is such a relatable character—smart, honest, neurotic—and her experience of entering adolescence is as awkward as anybody’s, which is comforting. Not to mention funny. One of my favorite lines is Margaret’s description of her current crush: “It’s not so much that I like him as a person, God, but as a boy he’s very handsome.” A super read for girls and boys alike. “I have no idea how to write this stupid book.” So begins this laugh-out-loud-the-entire-time novel, narrated by the smart, sweet, and self-deprecating Greg Gaines. Whether he’s making bad movies with his funny, angry best friend Earl or being forced by his mom to get to know Rachel, a high school classmate who has cancer, I was always amused by Greg’s perspective on things. Which is why, by the end, it was even more of a gut punch when I found myself so moved. This book wowed me in the way its narrator Junior is able to keep a sense of humor even when he has every reason to feel furious with the world. (“My parents came from poor people who came from poor people who came from poor people, all the way back to the very first poor people. Adam and Eve covered their privates with fig leaves; the first Indians covered their privates with their tiny hands.”) It turns out that sense of humor is the very thing allowing Junior to cope, a point which is further driven home by his sharp and hilarious cartoon drawings that blend seamlessly with Alexie’s writing. Nate Foster is another endlessly lovable underdog, a Broadway-obsessed outsider in his (perfectly-named) town of Jankburg, Pennsylvania who takes a secret journey to New York City to audition for E.T. : The Musical. Nate’s genuine wit sparkles on every page (regarding a shady stranger: “For a moment I wonder what the best way will be to make myself throw up on him when he tries to kill me”), and it’s beyond heartwarming to experience his discovery of a world where he finally feels like he belongs. Less than a year after Kate Quinn’s mother passes away, she learns the father she never met is the Republican candidate for U.S. President. Kate ends up joining him on the campaign trail, and her wry, very human reactions to this crazy, high-stakes situation (regarding her yearbook photo being used on the news: “Because there I was, looking half homeless, dirty hair thrown into a ponytail, dead eyes, splotchy skin, strained smile. On national television.”) are what make this book such a satisfying read. This wholly original book is about six-foot-tall praying mantises that wreak havoc on an Iowa town. But narrator Austin Szerba’s unique way of documenting such a strange history—drily referring to people as “real dynamos,” for example, as he simultaneously grapples with his own sexual confusion (he may or may not be falling in love with his best friend Robbie)--grounds the insanity, elicits the laughs, and elevates this book to classic status. A mere five pages into this book, I already felt like Simon Spier was my best friend. He’s smart, self-aware, droll, and kind, and we get to know him further through his emails to Blue, the guy whose identity he doesn’t know even though they’ve been courting each other for months. Both Simon and Blue are not out of the closet, so when a classmate sees Simon’s emails and threatens to reveal his secret to the school, everything quickly unravels. All the characters feel completely real, but especially Simon, who charms from cover to cover. To say this book was ahead of its time is an understatement, as you can trace the current crop of voice-driven contemporary YA right back to it. I remember laughing out loud during study hall as Holden Caulfield describes his encounter with his teacher Mr. Spencer. (“Old guys’ legs, at beaches and places, always look so white and unhairy.”) Somehow, sixty-four years after the book was first published, Holden’s voice still feels relevant and cathartic. Seeing as there will always be plenty of phonies in the world, I’m sure it will continue to be. Great list, Lance! Particularly agreeing with Me and Earl, Simon vs, and Better Nate, three favourites of mine - and will definitely check out some of the ones there I haven't read. You can follow Lance on Twitter and Tumblr. 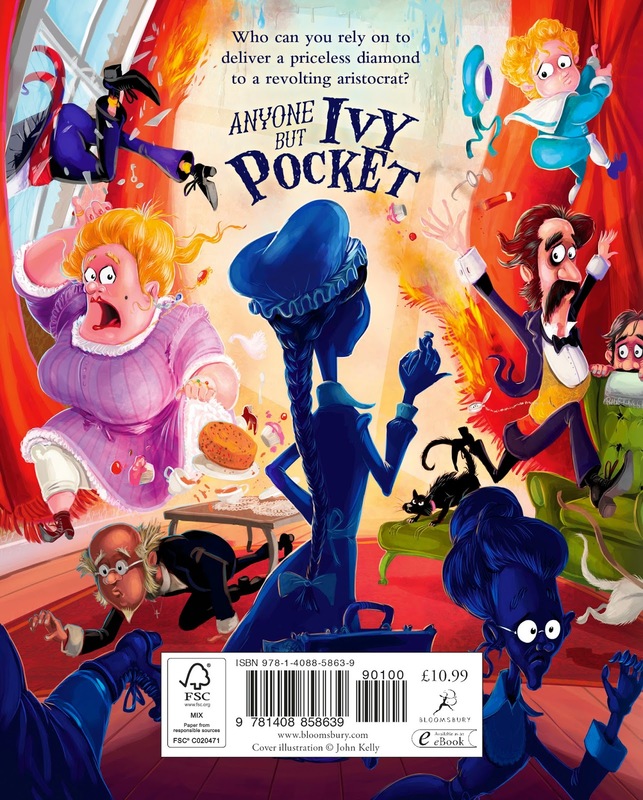 I loved Ivy Pocket when I read the proof - it's a fabulous story with a brilliant lead who you'll warm to but laugh at - but seeing John Kelly's illustrations made it an even better book. 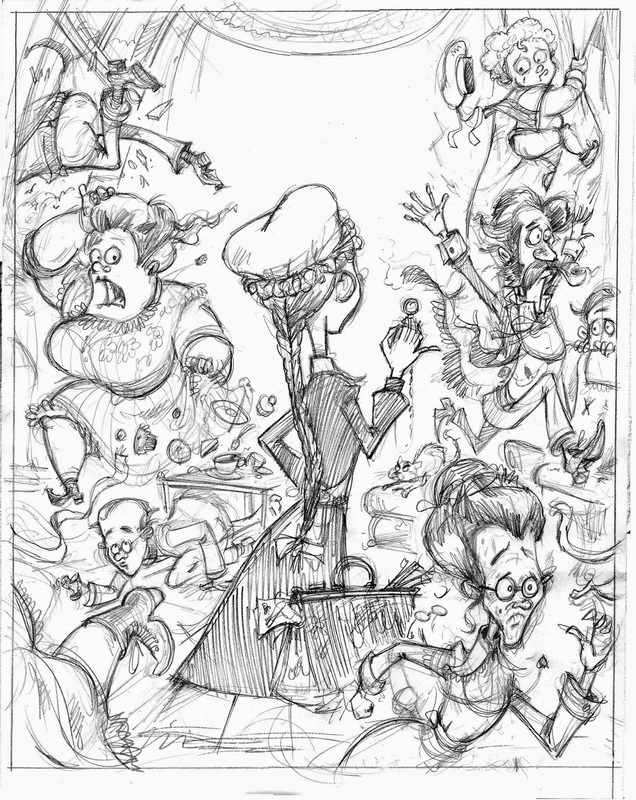 I'm delighted to have a guest post from him on the process of designing the cover! Ivy Pocket Cover: Fire, flood and defenestration. Ivy Pocket is an incredible character. She’s certainly incredibly delusional, incredibly dangerous, and incredibly unaware of the chaos that she creates wherever she goes. So the cover for her very own book needs to really try and get this essential ‘Ivy-ness’ across to the reader. The publisher’s first idea was to have some kind of complicated slipcase. It’s calm exterior would flip open to reveal an Ivy-generated Victorian domestic chaos within. Escaped monkeys were mentioned. I was excited. Sadly this wasn’t practical (the slipcase not the monkeys). Instead I was asked to illustrate Ivy beaming out her serenely smug and delusional grin from the front cover. 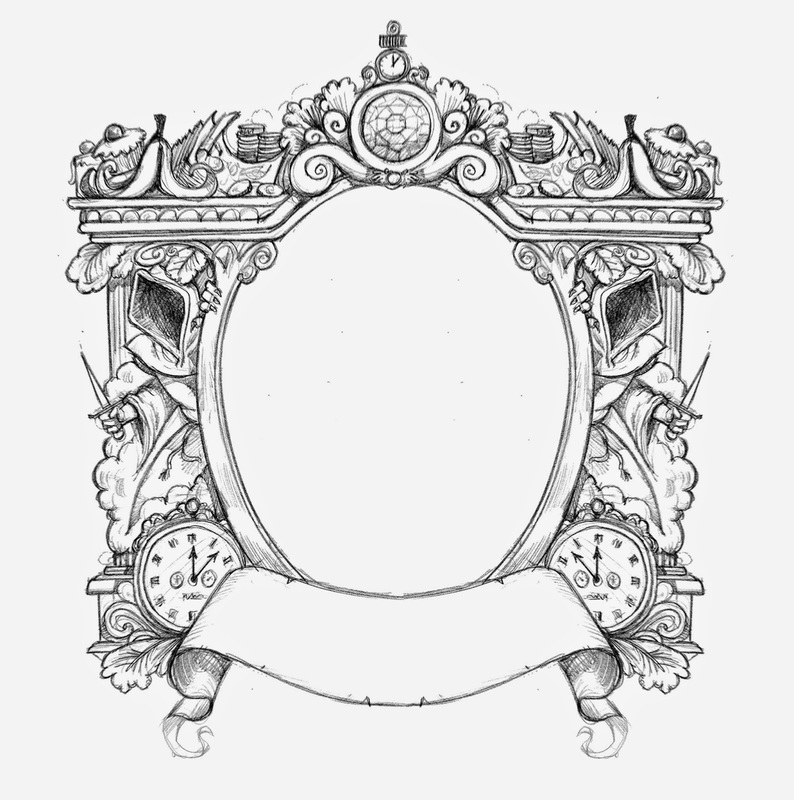 I designed a gilt frame to surround her. It illustrated certain key story elements; tiny hooded assassins, clouds of smoke, piles of cash, and a metaphorical banana skin to represent the effect Ivy has on the Universe. That left the back cover free to show a scene of the mad chaos Ivy has caused. In it everyone would be fleeing in terror from the living, breathing accident that is Ivy Pocket. 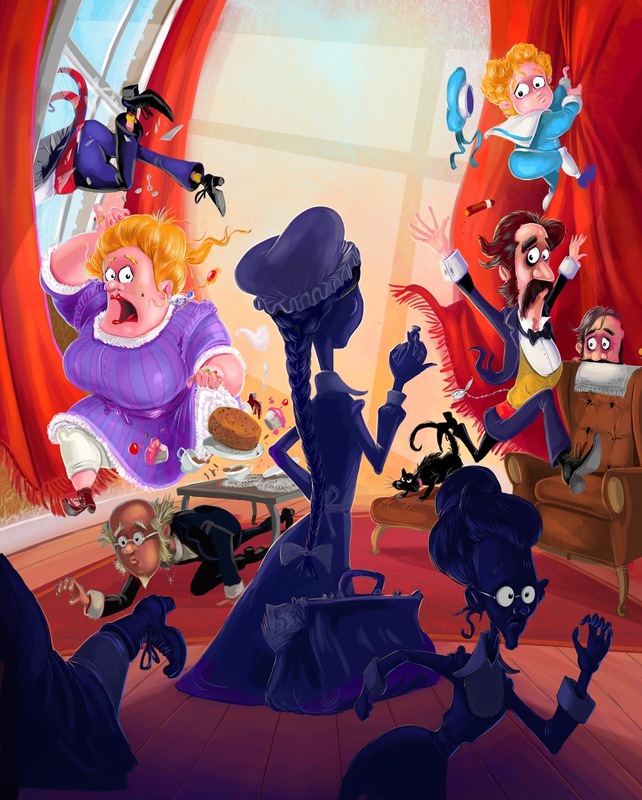 A small boy in a sailor suit scrambles up the curtains, a spectacled governess flees, the cowardly vicar hides beneath the coffee table, an angry cat hisses from a footstool, and a gentleman throws himself out of the window to avoid meeting Ivy. Unfortunately there were no escaped monkeys allowed. Once approved (no changes, hurrah!) I illustrated it with the digital paint programs ArtRage and Adobe Photoshop. 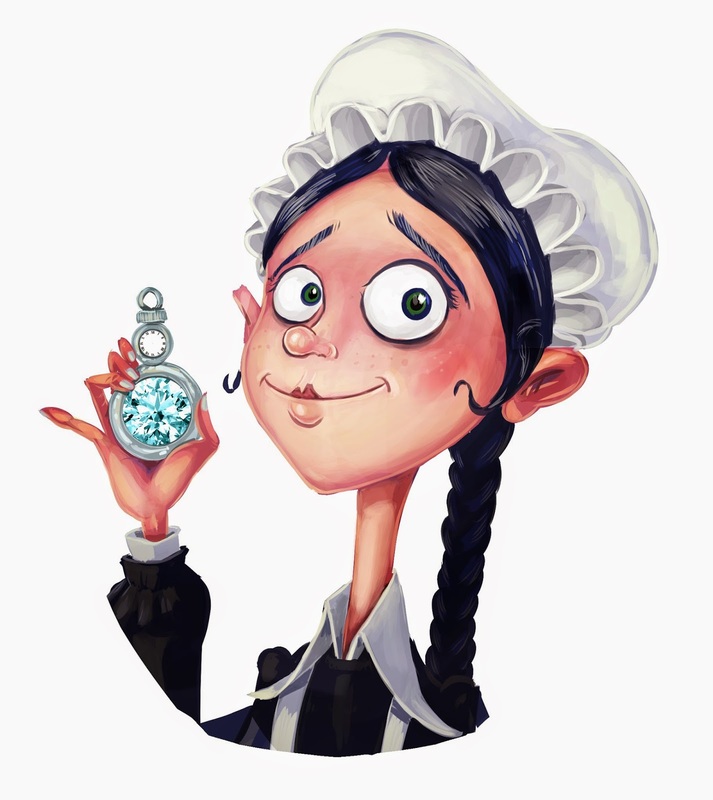 I swap between them as ArtRage has lovely direct painting brushes that simulate oil and Acrylic strokes, whereas I prefer Adobe Photoshop for lighting effects and adjusting colour. When the finished art was submitted, Katie Everson the designer at Bloomsbury felt it wasn't quite ‘manic’ enough. 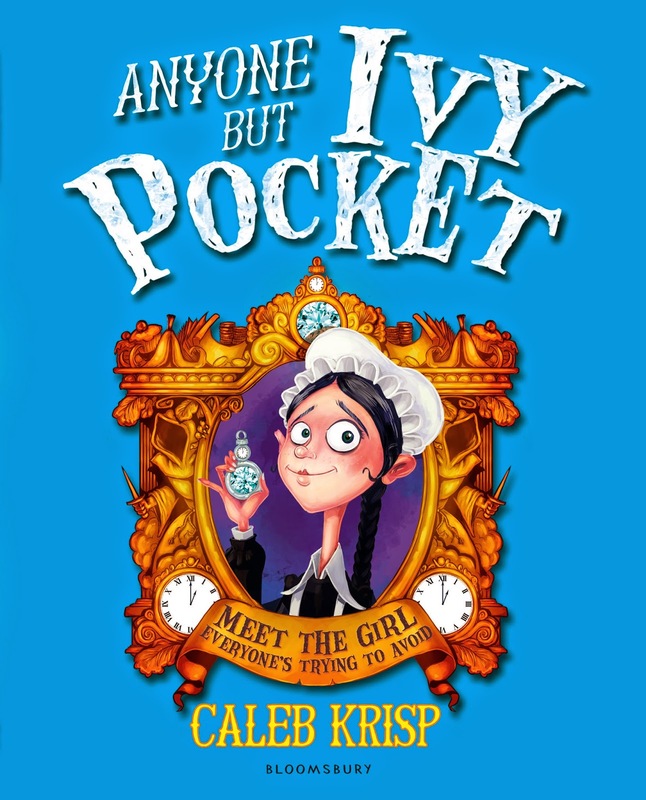 Not enough mayhem and property damage for an ‘Ivy Pocket’ book. So I went back and added fire, flood, but sadly no pestilence (unless the small boy has measles). The final artwork has the roof caving in under a flood of water (Ivy probably left the bath running), the curtains are on fire (don’t ask), and there's a lot more shattered glass, smoke, and scattered tea things. I’m doing the next book soon. It’s called: ‘Somebody stop Ivy Pocket’.